Christmas break finds most Baylor faculty enjoying a sabbatical of caroling, eating and resting from school obligations. But peek inside the home of Baylor School of Education (SOE) Senior Lecturer Tamara Hodges during the holiday season, and you will find her buried under books about improving teaching methods. Although Hodges is quite familiar with how to teach, she dedicates herself to ceaseless improvement. Her commitment to learning, along with her passion for teaching and concern for her students, are just a few of the reasons Hodges received the Baylor 2016-2017 Outstanding Faculty Award for outstanding teaching. 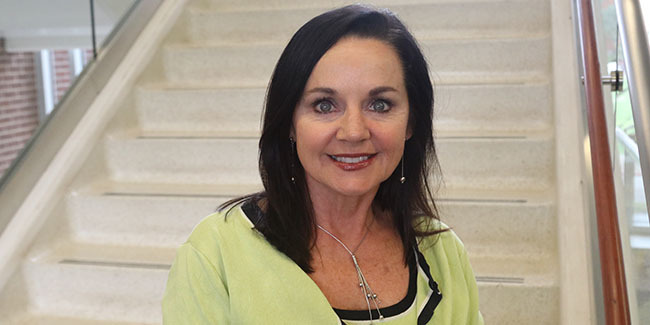 Hodges is one of seven to receive the Outstanding Faculty Award in the area of teaching. Others received awards for scholarship and for contribution to the academic community. Hodges said she was surprised and humbled, especially because the nomination came from her peers. Hodges joined the SOE in 2007 in the Department of Educational Psychology, selecting a lecturer position rather than a tenure track with the intent to focus on teaching and practicing psychology rather than the research and grants that accompany tenure. This path allowed Hodges to invest more time and effort into what she loves most — her students. 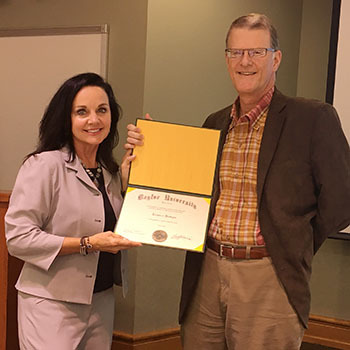 Dr. Hodges received her award at the May SOE faculty meeting from Dr. Terrill Saxon. Amy Hase, graduate student in school psychology, said Hodges has unparalleled care for all of her students both academically and personally. “She checks for student understanding at every step of the learning process and constantly considers feedback to give her students the most personalized and meaningful learning experience,” Hase said. Hodges frequently revamps her lessons, she quickly grades every assignment, and she never returns an assignment without feedback. Hodges is also a practicing psychologist in Waco, seeing individual patients, working in the Baylor Counseling Center, and assisting with Response to Intervention methods in schools — identifying children with special education needs and ensuring that children who simply need academic intervention get the help they need to catch up with their peers. “I love teaching, but I still love practicing, because I bring those stories and examples into the classroom,” Hodges said. Hodges also co-coordinates a grant from AT&T, EnAbled for College, that helps at-risk junior and senior high school students from four local schools transition to post-secondary education. Additionally, Hodges partners with graduate students to carry out Positive Behavior Intervention Services (PBIS) through a Baylor and Waco ISD project that targets behavioral challenges at a Waco elementary school. Hodges and the students identify where and how school rules can be and are enforced to help bring expulsion levels down. She teaches graduate and undergraduate courses in psychopathology, social emotional assessment, psychology of learning, counseling theories and techniques, exceptionalities, the developing child, and multicultural education. She also presents at professional conferences and mentors students. In summer 2017, Hodges taught a three-week course at Maastricht University in social psychology to undergraduate students from all over the world. Hodges said, “I love what I do because it gives me the freedom to do a lot of things and I feel like what I do is more of a calling than a job,” Hodges said. Prior to joining Baylor, Hodges taught elementary school for eight years and then worked in private psychology practice for eight years. Hodges graduated from Oral Roberts University with a Bachelor of Science in general education/special education. She obtained her master’s and Ed.D. from Baylor in educational psychology. While Hodges stays busy all year long, her students are always the driving force behind her efforts. For more news from Baylor School of Education, visit the Instant Impact home page. Founded in 1919, Baylor School of Education ranks among the nation’s top 20 education schools located at private universities. The School’s research portfolio complements its long-standing commitment to excellence in teaching and student mentoring. Baylor’s undergraduate program in teacher education has earned national distinction for innovative partnerships with local schools that provide future teachers deep clinical preparation, while graduate programs culminating in both the Ed.D. and Ph.D. prepare outstanding leaders, teachers and clinicians through an intentional blend of theory and practice.